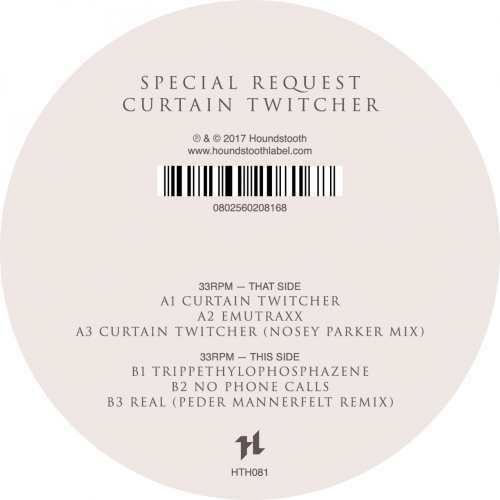 Fabric’s offshoot Houndstooth has brought to us knockout tracks from Paul Woolford aka Special Request. The A-side of the clear vinyl goes straight to the business with sweeping opener “Curtain Twitcher” where vitriolic braindance riffs are crashing into naughty hoover bursts. Bass-heavy stepper “Emutraxx” is saturated with quirky acid lines and Nosey Parker’s remix of the title cut keeps the noise level high with nasty synth riffs in Terence Fixmer style. After big beat-ish groover “Trippethylophosphazene”, the pace and mood changes when “No Phone Calls” revitalises slow rave atmosphere with grumbling sub-bass and vocal samples. Another treat is Peder Mannerfelt’s version of “Real”, an offbeat junglist piece that is focused on voice manipulation the dancehall way. 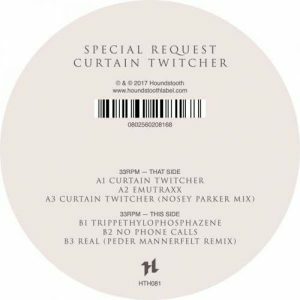 With about thirty minutes, “Curtain Twitcher” is good for a mini LP and after such an impressive performance I also copped the artist’s new quadruple pack on Houndstooth.